I've come to good2gether via a seemingly circuitous path, one includes a BA in Psychology, experience in an array of communications roles, an academic stint in wheelchair design in developing countries, and most recently, a curriculum development role helping to establish a non-profit in Sri Lanka. Although my past experiences might initially seem disparate, always they have involved the will to improve interpersonal relationships and community, and the desire to make an impact on a larger scale. Recently, I was looking for a new opportunity to help me continue along this path. A good friend of mine, who is an investor in (and advocate of) good2gether suggested that my interests might match up with good2gether's needs. One thing led to another, and after a presentation and a couple of conversations with good2gether staff, we've decided to give it a go. I'll be helping promote/raise awareness for good2gether using social media...viral marketing but without the negative connotations. We want to enable others to help others, by reaching out to communities across the US, and then the world. If we can utilize Social Networking sites like Facebook (that I've seen in action in cafe's in Europe, Africa, Asia, and Latin America) to rally communities, then I think we've done at least a small part in making that large scale impact... in making the world a better place. More markets. More people doing good. A change to our launch schedule - Do Good San Antonio goes live in December instead of January. The Do Good Channel has been up for a while but not linked from MySanAntonio.com - that was originally scheduled for January but they’ve now moved that up to December so that they can start marketing it sooner. That’ll give us four launches in December (though Philly will probably be a soft launch). With an open slot in January and St. Louis pushing to move forward we’ve tentatively moved them up to a January launch. That’ll give us four launches in January and we’ll look to slot someone else in February to fill the slot vacated by St. Louis. More markets. More Do Good Channels. More people doing good - finding nonprofits and getting involved. If you're a nonprofit and want to learn more, take a webinar. Or if you're a nonprofit and ready to get started to put the most largest and most powerful network of people ever assembled to Do Good to work for you, sign up here. At good2gether, we're transforming cause into effect. If you want to know what we're all about - what we care about - this is it. The above is from today's Boston Globe/Boston.com - read the whole article here. At good2gether we provide the simple, easy-to-use infrastructure for cause engagement. An easy way for nonprofits to enter their stuff. An easy way for people to find their stuff. An easy way to share that stuff with others. Events. Programs. In-kind donations. Volunteering. We put Do Good Channels at newspapers today. But why not Do Good Channels at colleges & universities tomorrow. Why not Do Good Channels at high schools the day after that. And on Facebook. MySpace. And beyond. Wherever people are online, there'll be Do Good Channels & connect2cause widgets to help them find way to engage. To make a difference. Whether they're young or old or in-between - they'll be able to find ways to make real and important change in the world. If you're a nonprofit, take a webinar to learn why good2gether and our Do Good Channels are changing everything. And if you already know about what we're doing and are ready to go, click here to sign up and get started. Our tag line says it all - Transforming cause into effect. That's what we care about. That's why we get up every day and do what we do. We are making it astonishingly simple for nonprofits to find people and for people to find nonprofits - to connect people to cause. 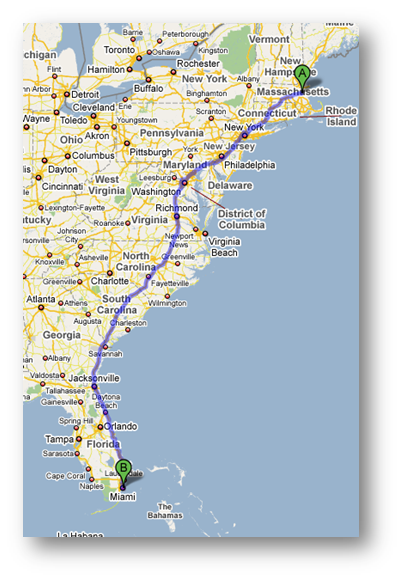 Need flowers in Sarasota, FL? If you are in the market for flowers Sarasota, make sure you order them from Beneva Flowers! 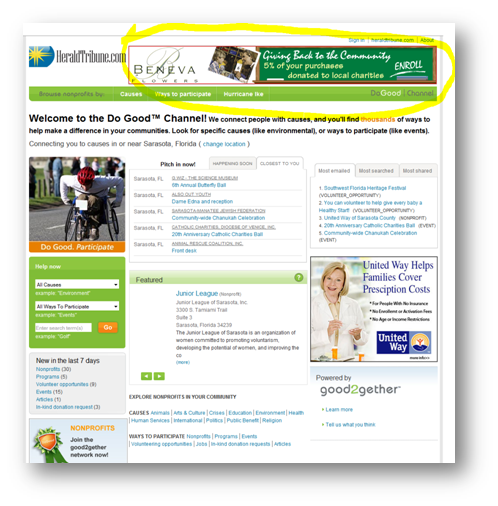 They are sponsoring the Do Good Channel at The Sarasota Herald Tribune. And they tie the sponsorship directly back to their support of charities ('give back to the community'). This is a terrific example of a local business taking advantage of the Do Good Channel to deliver their do good messaging and to promote their business objectives. Nice. And we should all support businesses that help support nonprofits. Busy day with five calls to talk about and demo good2gether and our Do Good Channels. If you're a nonprofit and want to learn how good2gether and our Do Good Channels can help your organization reach more people - register for a webinar. Kris does an amazing job and you'll learn a lot. If you're ready to sign up, do it today and get going. If you're like to schedule a one on one with me to get the story, drop an email to anelson at good2gether dot com and she can schedule it. Believe me, give the challenging economic times we're facing, you can't afford not to take advantage of what we're doing. I'm showing Al how easy the syndication widget is to use. See Al, easy! Here's how you can help American Dachshund Rescue. And the syndication widget delivers Best Buddies MA program information. If you're a nonprofit ask us how you can use syndication to deliver your stuff - events, volunteering, programs, and more - back to your own web site. Today is 'blog action day' and the focus is on poverty. You can learn more here –it's about "Blog Action Day is an annual nonprofit event that aims to unite the world's bloggers, podcasters and videocasters, to post about the same issue on the same day. Our aim is to raise awareness and trigger a global discussion.". So, want to do something about poverty? Go to the Do Good Channel in Boston and find a nonprofit and get involved. 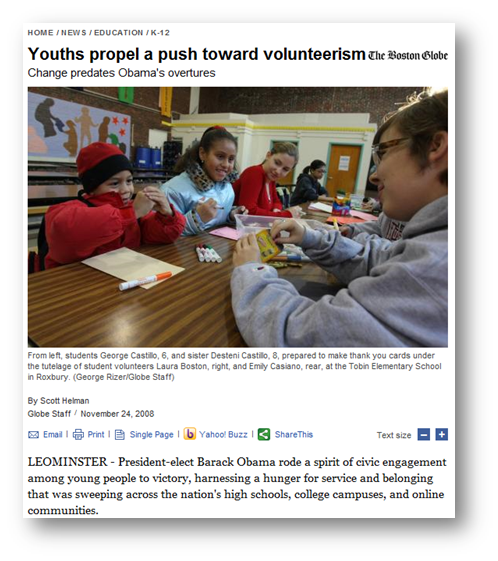 Want to find nonprofits in Boston that are working on poverty – click here. Same thing in Atlanta, here's the Do Good Channel in Atlanta and here are nonprofits that are working the issue. And let's not forget San Francisco – here's the Do Good Channel and here are nonprofit fighting poverty. Get involved. Do something. Do Good! Are you a nonprofit in Boston? Not in good2gether? You're missing out. Tens of thousands of people are looking for you at the Do Good Channel at Boston.com. Tens of thousands? Yup! If you're not there, you're not anywhere. Or, at a minimum, you're not where thousands and thousands of people could find and engage with your organization. And given that it's free - why wouldn't you do it? Especially in these challenging economic times. Want to learn more? Take a look at 'Jane'. Take a webinar (Kris is amazing at telling the story). Or just click her to sign up today.